Ban Phe, the pier for boats to Koh Samet, is under three hours drive from Bangkok, so the island is very popular with both Thai and Western tourists. It offers all the essential elements that make up a fun-filled holiday. Stunning blue seas, idyllic white sand beaches and a wide range of activities on both land and water. The island caters to diverse groups of tourists and offers a wide range of accommodation from beachfront bungalows to five star hideaway resorts. 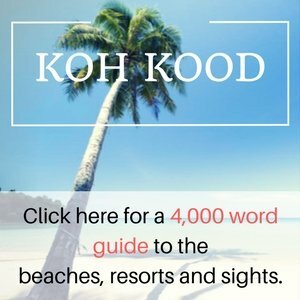 If you want a break from city life in Pattaya and Bangkok, and islands such as Koh Chang, Koh Kood or Koh Mak are too far for a short break, then Koh Samet is well worth visiting. On this site you’ll find all the information you need regarding getting to Ban Phe and boat services to Koh Samet. Please note that boat timings depend on which beach you are staying on and are also on ‘Thai time’ so may vary by 20 minutes or more. The weather and number of passengers may also affect when the boat departs. In late 2017 a new, high speed ‘Khokaew Phitsadan’ catamaran service was launched between Ban Phe and Koh Samet. This combines the speed of a speedboat, just a 10 minute journey, with the safety of a large, modern boat. Unless price is a serious issue, then this boat service is currently the best way to get to the island. There are regular sailings throughout the day from early morning to late afternoon. Ticket price is 150 Baht per person one way. The ticket office is located roadside opposite the police station near Tarua Phe pier. Several of the better resorts run free boat services for guests. Boats usually run 3-4 times per day in each direction. If you are arriving outside those times then you will have to take a public boat to the island. But it makes travel much easier if you can use your resort’s own service. Based at Ao Prao pier ( formerly known as Sri Ban Phe pier ) . Take this boat if you are staying at: Paradee Resort, Le Vimarn Cottages, Ao Prao Resort, Saikaew Beach Resort, Samed Club or Ban Ploy Sea Resort. This is the quickest way of getting to Koh Samet. There are several companies and the speedboats run 24 hours / day. Note that night time sailings are more expensive then daytime. Figure on around 2,000 Baht to hire a private speedboat to take you from Ban Phe to Koh Samet during daylight hours. Check tour agents in the village or around Municipality pier if you arrive late night and want to get to the island in a hurry. These prices are a guide and subject to negotiation. Most speedboats will take a maximum of 15 passengers. Private boats will run at night but there will be a surcharge of 200 – 500 Baht. The small port of Ban Phe is the departure point for speedboats and ferries to Koh Samet. There are regular, scheduled boat services but timetables aren’t necessarily fixed as public boats will until there are enough passengers before departing. At the weekend or during High Season this isn’t an issue as there is a steady stream of people arriving throughout the day. But during Low Season (May to October) you may have to wait at the pier for up to an hour on weekdays. If you find that you have to wait for a boat there are a multitude of small coffeeshops and restaurants close to the piers plus several mini-marts where you can get a drink and bite to eat. For visitors who haven’t booked accommodation on the island, there are also numerous tour agents which can book bungalows for you. This does save you time when you arrive. But outside weekends and the busiest times of year advance booking isn’t necessary to find a room in almost any budget. The only advantage is saving you time and effort when you arrive. Koh Samet is a National Park, although you might not think that given the amount of development on the island. However, unlike Ko Chang island, which is also 75% National Park, all visitors to Samet must pay a National Park entrance fee. Thai tourists pay 40 Baht for an Adult and 20 Baht for Children. Foreign tourists pay 200 Baht and 100 Baht respectively. You can usually pay this either when you buy your boat ticket or when you arrive on the island. Google Streetview shows the main piers clearly. You can enjoy a virtual drive along the high street in Ban Phe which runs past all the piers. You’ll see it’s lined with small minimarts, coffeeshops and restaurants, catering to people visiting Koh Samet. Which Pier Should I Use in Ban Phe? As you’ll see from the map there are several piers in Ban Phe. The all offer a range of boat services to Koh Samet either by wooden boat or speedboat. The wooden boats are much slower. They take around 45 minutes to get to the island. Whereas the speedboats are a lot faster, crossing in around 10 minutes, but are far more expensive. Scheduled boat services only run in daylight, form around 07:00 – 18:00 daily year round. Most of the wooden boats used are refurbished fishing boats powered by an old diesel engine. They are slow but are reliable and on a sunny day you’ll be able to enjoy the views as you head to the island. The speedboat services are handy if you are travelling to one of the beaches further south on the east coast or are in a large group. Also, if you need to get to or from the island very early or late night then you’ll need to hire a speedboat privately. The price depends on the number of passengers and destination on Koh Samet. The wooden boats all moor at Na Dan pier on the northeast shore of Koh Samet. This is the main pier on the island. In addition to the National Park fee, visitors arriving at Na Dan also have to 20 Baht for the pier maintenance fund. The piers in Ban Phe are all relatively close together, so walking from one to the other isn’t a problem. Buses and minibuses tend to drop visitors off at Nuan Thip Pier. This is where you’ll be able to take a wooden boat or speedboat to the island. The wooden boats run hourly but the speedboats require 10 passengers before they will depart. Boat tickets for the wooden boat are the same at all piers 70 Baht one way and 100 Baht return. There is no requirement to buy a return ticket. You’ll be able to buy tickets from your hotel or any tour agent on the island. A stone’s throw Nuan Thip Pier is Tarua Phe pier. This is the most popular pier for anyone wanting to take a speedboat to Koh Samet. Two speedboat companies ‘Black Pearl’ and ‘White Shark’ are based here. Ticket prices are from 200 to 500 Baht per person, depending where on the island you want dropping off. Wooden passenger ferries also run hourly from both Chok Krisda Pier and Sri Ban Phe Pier also known as Seree Pier. These are more popular with Thai visitors, simply because they have secure, covered parking areas for passengers to leave their vehicles. If you are staying in one of the larger resorts, a luxury hotel or resort owned by one of the extended local families, then it will probably have it’s own private boat service. This is usually free but the downside is that there will only be a handful of departures per day. So if you miss a boat then you’ll have the choice of waiting until the next boat or taking a public boat and then also having to pay for a pick up truck taxi to the hotel when you ready the island. When you arrive at Na Dan pier on Koh Samet, you will see green, shared pick up truck taxis ‘songthaews’ waiting to take passengers to the beaches on the east coast of the island. These take the island’s main road. A narrow strip of concrete that runs from the north of the island down the east coast to the south. The driver will drop off at resorts on Hat Sai Kaew, Ao Phai, Ao Tubtim, Ao Lung Wung and Ao Wong Duan. The taxi fares are expensive, from 50 – 200 Baht per person. if we leave from Suvarnabhumi Airport 08.00 in the morning, is it possible to prebook a private boat leaving Koh Samet late night and what cost is it? It is possible. But the price will have to be negotiated with a tour agent or boat company when you are on Samet. Is there any car parking near the piers in Ban Phe? And if there is… is it wise to leave a car there for a few days? Yes. You can park at the piers. Most Thai visitors drive to Ban Phe and will leave their cars there when they visit the island. I will be traveling from BKK to Ban Phe, but expect to arrive at about 18:00. Is that I can only take speedboat? How much will be that be? I’m only one person. Thanks. Hi Winnie. The public boats will have stopped. But you might be able to find a group hiring a speedboat privately and join them. Or stay the night in Ban Phe and early next morning take a public boat. Thanks. I had booked hotel at Koh Samet already for the night of 28th. Usually will have the private speedboat right? Roughly how much will u know? It won’t be any problem getting a private speedboat. Hello, We will be getting the wooden ferry this coming Sunday 24th Feb. I read somewhere that the national park fee is waiver-ed for over 60 year olds. Is that available for none Thai persons? Also can we purchase our return tickets easily at the pier? Or are we better off buying return tickets online? If online what is the webpage please? Over 60s are free – if they are Thai. But foreign visitors have to pay. There are various boat services, so you can buy tickets at the pier. No need to do that in advance. And no need to buy a return ticket as you can get them from your hotel or any tour agent on Koh Samet. Thanks for your help. Just a warning for people. When we got out of the taxi a woman grabbed up and directed me to a desk where another woman was trying to upsell speed boats then I said I only want the wooden ferry. She quoted 100 oneway and 200 return. I was arguing that the price was half that. She insisted. I went and asked my friend whom thought the lady was correct. Hence we paid double price. we ended up totally confused. Once on the island we heard these people are currently ripping many tourists off. When we returned we couldn’t find this couple, I think they hide from people they have ripped off. I also for the life of me could not find the normal ticket office? Thanks anyway. I feel people need to be aware. We are planning to stay at Vongdeuan Resort, Koh Samet, from the 16th of March – 24th of March. We are arriveing to the airport in Bangkok 4.45 pm and planning on taking a taxi to Ban Nan Peir. As I can see it from the timetable there are no late departures by boat at our time of arrival (around 8.30 pm). Is it possible for us to take a speed boat to our accomodation at this late hour or do we need to take a hotel on the main land`? Thank you so much for you reply! Yes. You’ll be able to arrange a private speedboat. Black Pearl or White Shark speedboats are available 24 hours. There is secure parking near all the piers. Am I able to bring my bicycle on the wooden boat? Yes. That is Ok. You can take a bicycle on the wooden boat. Thank you for your quick reply and for the information. Hi, are there extra costs for a bicycle? What time does the last ferry leave for Koh Samet? Are tickets available online for January 1 on the last ship? Tickets can’t be booked online. But your hotel on Koh Samet might be able to arrange them for you. The last scheduled boats are around 5pm. But after that you can take a speedboat privately until late night. Hi, how easy is it to get on and off the boats? I still have nightmares of climbing in and out of the narrow boats and the ferry at Railay! I will have a regular suitcase this time so I’m panicking. We would like to take a day trip to Koh Samet on November 10, 2018 (for 2 persons). We stay in Sukhumvit area, how do we get to the Ban The pier from Sukhumvit area? Do you have any tips and recommendation for us to get there? And also, please provide the estimation prices for any transportation from Sukhumvit to Ban The pier. Thanks! If you are only going for a day then you should arrange a private transfer or take a public taxi from Bangkok to Ban Phe. This will be about 2,000 – 2,500 Baht one way. Your hotel o any tour agent nearby will be able to arrange that for you. Hi im planning my trip in october 2018 7-17. Im planning to stay at sangthain hills. How do i get to this resort from ban nan peir. And if i want to change later the hotel to another resort how do i reach there. There are shared pick up truck taxis on Koh Samet. These take passengers from the ferry pier to their hotel. Or from hotel to beaches on the island. Your hotel can call one for you. Or you can flag one down roadside. We are planning to stay at Paradee resort, but on 18th of September we need to be on the mainland on 7.30AM. By the resort boat we can go on 04:00 AM, that is to early for us or 11:00AM. Can you provide a speedboat on 07:00AM at Paradee resort and what is the price? I can’t arrange a speedboat for you, but you will be able to book it at any tour agent on Koh Samet. Figure on around 2,500 Baht for a private speedboat to Ban Phe. please how much would it be for a private speedboat to koh samed to Nimmanoradee Resort ? we are 4 persons,is on december 30th. My friends and I want to rent motorbikes from Bangkok and ride down to Koh Samet. Do you know if we can bring the motorbikes onto the ferries? No, there are only passenger boats to Koh Samet, no vehicle ferries. You can rent a scooter on the island. Hi, we are a group of 14 people and we will arrive at BKK Don Mueang the August 22 at 13.00 from Siem Reap. I’ve booked at Baan Rom Talay Made for 4 nights. Can You arrange a private speedboat for us? I don’t know exactly how much time we need from airport to pier. Hi. Sorry, I am not a tour agent so I can’t book boats for you. But you’ll be able to arrange it through any tour agent in Ban Phe or when you arrive. It will take around 3 to 3 and a half hours by car / minibus from Don Meuang to Ban Phe, maybe more depending on traffic. Is it possible to go from Bangkok to koh samet in october with the ferry? We are planning to go to koh samet around 20 october and back to Bangkok on the 26 of october. My husband heard that the ferry isn’t available around that time of year. There aren’t any boats from Bangkok to Koh Samet. You have to go overland to Ban Phe and form there take a passenger boat to Koh Samet. The boats run every day of the year. Is this 2018’s timetables? If i go by bus from Ekkamai at 13.00, is it possible to get there before the last ferry ? Hi. I can’t arrange a private speedboat for you. You will need to contact a tour agent or ask your hotel. We would like to book a speed boat to koh samed (Lima Duva Resort) would you pls let me know how much would that be for a big group of 32 persons and with 26 luggages. it is on 30 th MARCH 2018. Your resort runs a free boat service for guests and can also offers a private speedboat service. You will need three boats for your group. Great site! Glad I found it when i was planning the trip to the island. How much would it be for 2 people on a speedboat to Samed Villa Resort? Our stay will be in January and we booked in Sangthain hills, and I want to know how much it coast from Ao wai to Ao thian by taxi? how much would it be for a private speedboat to koh samed. Can you give Us a Price for a private speedboat from mainland to vongdeun resort about 11 pm the 20. February 2018. Or maybe you Can give US a mailadress to a speedboat compagny.